OK, let’s put the brand new service provider model to some good use. The basic implementation will get the infrastructure up and running. Now, I could demand that the app.xaml has this one (or any other service implementing my interface) registered. However, I like to be correct by default, thus my accessor will fall back on this implementation if none is registered – and I can be sure that there will always be a respective service. Second act. Get rid of those dull things. Some code is needed for the initialization. The message has to be set, the correct image made visible, etc.. I could probably have done this with less coding, using some tricks and elaborate databinding. But who cares, it’s straight forward and comprehensible (unlike what I probably would have come up with). Setting the DialogResult property also closes the dialog (sik!). Second, I wanted to see/demonstrate the service provider pattern from a user’s point of view. 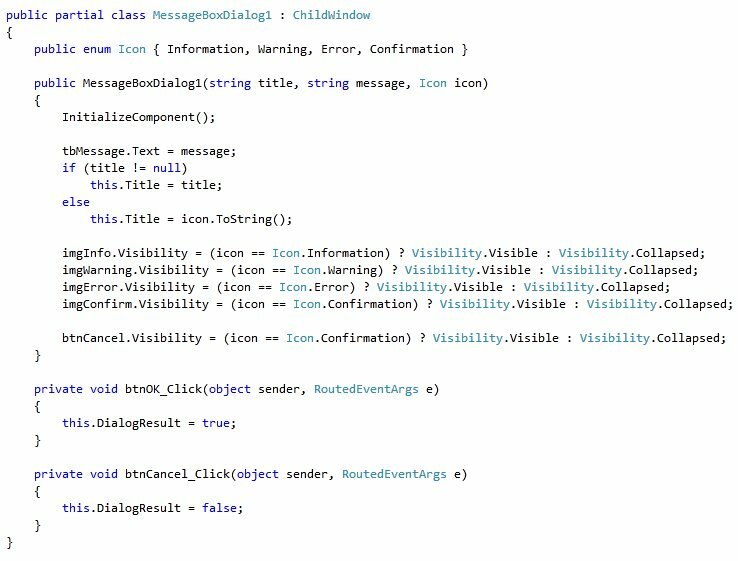 And third – as you may have noticed from some screenshots – I used this implementation to check out VS2010 beta. The core system, i.e. the shell, the C# code editor, build system, etc. feels very good. No apparent bugs, quite fast, including intellisense, and close enough to VS2008 to feel familiar. Considering that big parts of this are complete rewrites, this is quite an achievement. 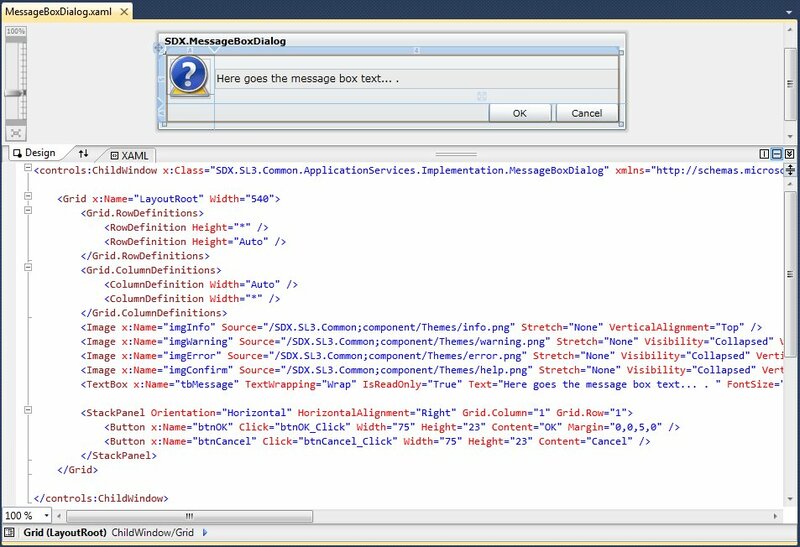 The visual designer for (Silverlight) XAML works nice for user controls. Designing grids, the property pane, and other tasks, is at first glance en par with Blend, but comes in a more familiar „Visual Studio flavor“; still it feels more rich and mature than VS2008. However, there are some notable gaps. Editing of styles and templates, animations, and visual state manager are not covered. Thus my guess is that Blend will remain a necessary complement to VS, even if one has to switch less often. BTW: Contrary to what Tim wrote, I could work with Blend on VS2010 solutions (the project that cannot be loaded is only the web project), I just refrained from manipulating my project files with Blend. Other areas I touched briefly have been less satisfying. IntelliTrace didn’t work, but I didn’t spend too much time on that. The architecture and modeling area for example has changed, but is by no means bug free (to the point of “not yet usable”). The profiler has evolved, but IMO still lacks what DevPartner offered nearly 10 years ago: a decent call graph. Oh, one bright spot for any dev lead: code analysis (FxCop) rules are now maintained in separate files, projects reference these files by name. Anyway, I have been using VS2010 beta since I installed it and was never compelled to switch back to VS2008. I’m going to have to reinstall my machine anytime soon, and I’m planning on going along with VS2010 beta, not installing VS2008 at all. The last post used the new Application Extension Services (AES for short) to include security into the application. This time I’m going to take AES one step further, laying out yet another piece of basic infrastructure. As a quick recap: An AES is a simple class, implementing a simple interface (IApplicationService) and optionally another one (IApplicationLifetimeAware). 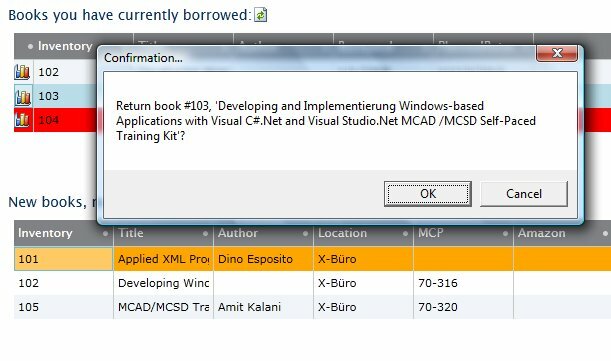 It is then registered by the developer via the app.xaml. SL3 instantiates the AES at runtime and calls the respective callback methods on said interfaces, including StartService, StopService, and others. The recommended way to use these services is to maintain a static property and reference the class accordingly. Basically AES solve one problem: How do I extend the global application class, without actually replacing it, i.e. without providing a derived class? The problem here is that many libraries need some kind of global anchor and in the past, tool developers often chose to provide this by subclassing the next available central artifact (e.g. the page class or the application). And the next tool developer doing the same rendered those two libraries mutually exclusive, just by employing an adverse implementation strategy. Following the recommendations, I get singleton access to some object. Worse, the calling code is directly and tightly coupled to the AES class. But frankly, do I need SL3 to implement a singleton? Certainly not. Then why use AES in the first place? What I’d love is to have the consumer code depend on some service (read interface), not on the actual implementation. And the ability to swap those services in and out, without affecting the caller. 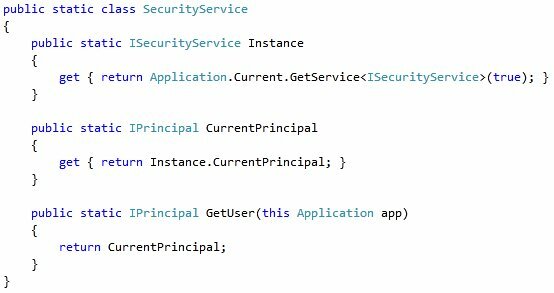 Matter of fact, the calling code doesn’t and shouldn’t care whether I use a SecurityServiceThatGetsItsInformationFromTheServer or a SecurityServiceThatGetsItsInformationFromWindowsAzure (or google account, open id, whatever). If I could get that, AES would become a very valuable feature… . OK, what the calling code needs is some service in terms of a contract, say ISecurityService, that it can ask for. And the same is true for any crosscutting concern, such as error reporting, tracing, caching, you name it. And actually .NET has already addressed this need with the service provider pattern. This pattern has been used for example in WF (e.g. to introduce workflow instance persistence), and quite extensively in the Visual Studio design time infrastructure. The base class ApplicationServiceBase implements the two interfaces with respective empty virtual methods, thus I only had to overwrite StartService. Aside from some reformatting the most notable difference with the previous implementation is the absence of the static Current property to access the service instance at runtime. I also renamed the class to reflect what it does. Since the calling code won’t refer to that name any more, this is now feasible. BTW: Wouldn’t it be nice to have extension properties that I could attach to the application class…? 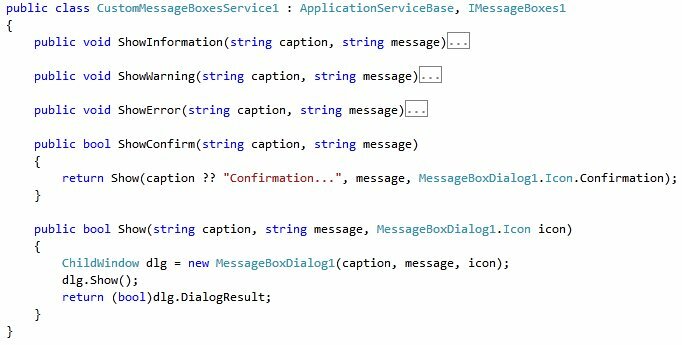 Now the calling code is completely decoupled from the actual implementation of the security service, meaning I could replace it without affecting the calling code. 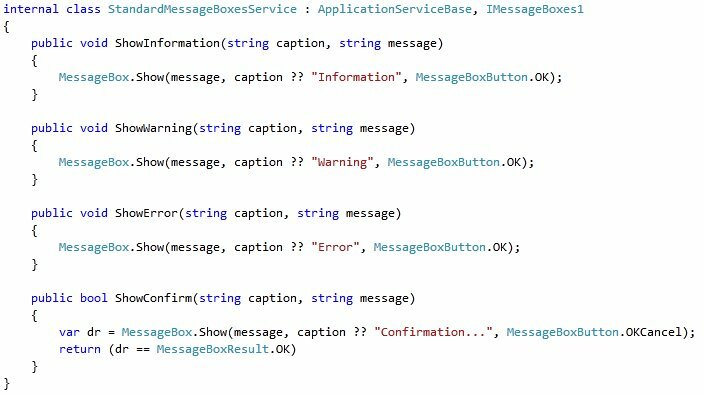 Last chance exception handling: A service will react to the unhandled exception event and gather context information. It will then use another service to report the error. 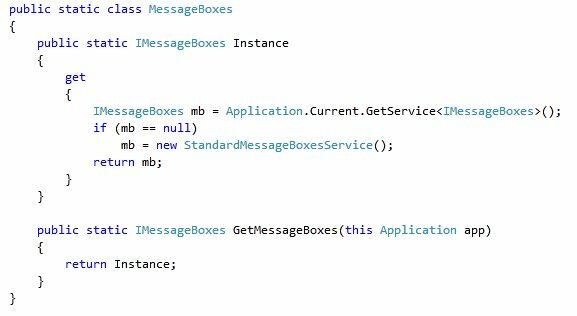 Message boxes: I will need message boxes for errors, information, and confirmation. The system MessageBox is however somewhat dull. A service will cover that and a later implementation will replace the boring system dialogs with nice and shiny replacements. Logging and tracing: At some point I will have to tackle these demands. I’m sure you can think of other examples, like navigation with parameter passing, global state, caching, …. Anyway, I think this is motivation enough to roll out some additional infrastructure. As a side note: Actually I had a completely homegrown implementation of this pattern for SL2. When SL3 came out and offered AES I quickly jumped on the bandwagon and threw away most of that code. If only Microsoft had not stopped one step short of my needs… . I’d rather have the platform support that out-of-the-box. And given the simplicity of the remaining implementation this shouldn’t have been too much of an issue. OK, back down from vacation – proud about the accomplishment and perhaps with some new perspectives. It really makes you think about the effects of the financial crisis if you happen to work primarily for banks… . Well. The last post (pre-Kili ;-)) provided me with the necessary infrastructure to address the next topic: application security. Silverlight is “secure by design”. It runs in a sandbox, only allowing restricted access to the local machine. Regarding server calls it supports HTTPS and windows authentication for intranets, it restricts URL access and allows only calls to servers explicitly opted in for. 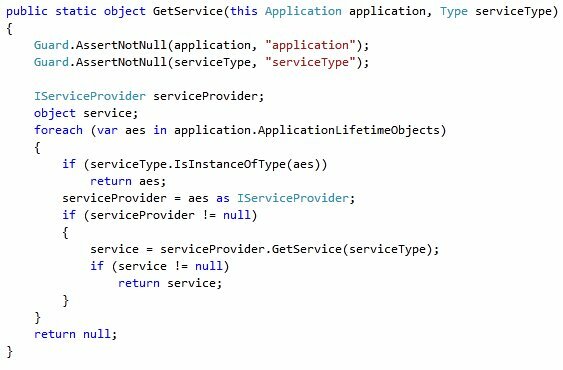 From a .NET perspective it has a changed programming model, no longer supporting CAS, but a more simple model that takes the restrictions into account that are already in place. It has the well-known interfaces IPrincipal and IIdentity in place, yet no implementation and no anchor to ask for them, like HttpContext.User in web applications. Silverlight is so secure, it doesn’t even tell you, who you are. From a purely technical perspective this is perfectly in order. The services I call are running on the server and it’s their job to make sure no one does something or gets to know something he isn’t entitled to. On the other hand, many intranet applications need to know the user name, if only to display it. And they need the permissions granted to the user to hide buttons, menu entries or make edit fields read only – none of that for actual security reasons (the server would take care that the user couldn’t do any harm, anyway), but to improve the user experience, not letting him do things and telling him afterwards that he has had no permission to do what he did in the first place. User and roles are available at the server at the ASP.NET runtime, and one “only” needs to make it available to the client. Matter of fact, ASP.NET provides the necessary service implementation readily available. 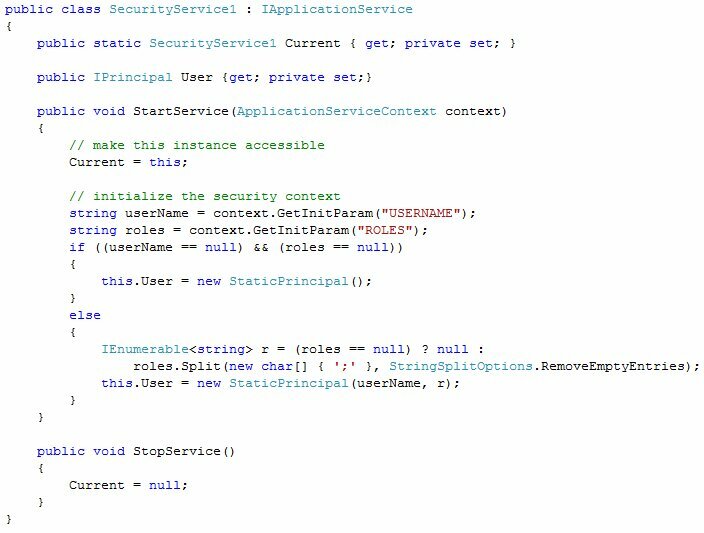 This is also the way to integrate with ASP.NET forms authentication. 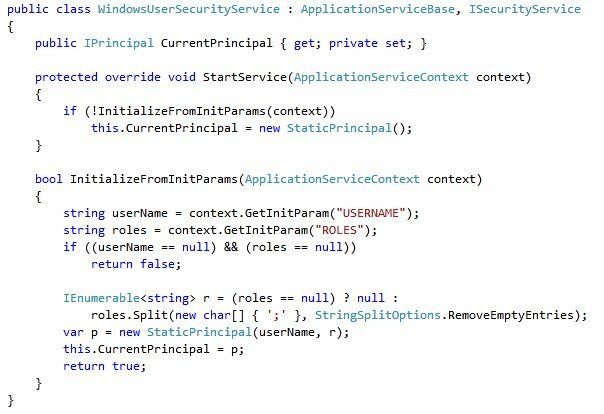 There are two caveats with this approach, though: These ASP.NET services provide roles and all, but they just don’t include the user name. Also, being services, I would have to call them asynchronously, which would incur at least a little time lag after starting the application, that I would have to deal with. A time lag that is unnecessary in intranet applications where the user is determined by windows authentication. 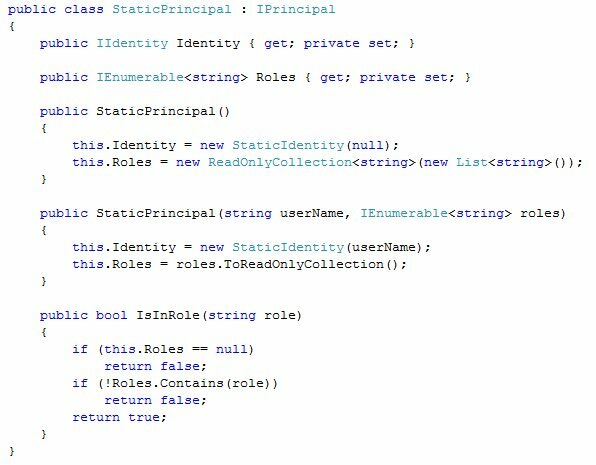 On the server include the information about user name and his roles in the initparams, so that it is available for the SL application right form the start, without any lag. On the client pick up that information and mimic HttpContext.User to have a similar developer experience. Of course, someone could fake this data, which might at first glance be a security flaw. But as I said, this information is only used to improve the user experience. Even if someone masqueraded as a different user, the sandbox on the client side still uses the actual user’s restrictions. And the same is true for the services that still have the responsibility to enforcing security anyway. I’m also not revealing sensitive information, since user name and permissions are not exactly protected data. And finally I could load the web page containing this data via HTTPS. Thus, form a security perspective I’m on the save side. Mimic HttpContext.User? Well, there is no HttpContext, but we have the Application object which can be seen as a pendant of sorts. (I wouldn’t relate it to the HttpApplication, though, since an application in the ASP.NET sense spans all users.) Yet I’m reluctant to provide a base class to inject my pet feature, because that would bring me into conflict with any other library that may one day choose to do the same.